"Talents to administrate Heaven and Earth 经天纬地 (jīng tiān wěi dì)"
Scrawny and wind-worn with age. This is the constant stereotypical image of Chinese military advisers, and these two aging old men fit that stereotype perfectly... well, sort of. Though the images and portraits show Zhang Zhao and Zhang Hong as old geezers, the pair were already advisers to the Wu kingdom since they were much much younger. Collectively known as "Er Zhang 二张" or "The Two Zhang's", Zhang Zhao and Zhang Hong were first recruited by the the warlord, Sun Jian 孙坚, who was Sun Quan 孙权's father. The two Zhang's were approximately the same age as Sun Jian and will stay loyal to the Wu Kingdom for decades till their death. Tragically, the two Zhang's went through the deaths of both Sun Jian, and his elder son, Sun Ce 孙策. It was on Sun Ce's deathbed that he famously said to his little brother Sun Quan, "Should [you] have doubts upon internal affairs, [you] must turn to Zhang Zhao; for outer matters [you] must consult Zhou Yu 周瑜." Sun Quan wisely employed the two Zhang's for the entire duration of his reign, and saw the Wu Kingdom rise to become one of the three crucial kingdoms of the era. 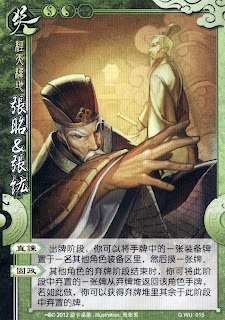 Character ability 1: "Blunt advice 直谏 (zhí jiàn)"
During your action phase, you can place an on-hand equipment card into the equipped item area of another player, and then you draw a card. Character ability 2: "Stabilization 固政 (gù zhèng)"
At the end of other players’ discard phase, you can return a card that was discarded in this phase from the discard pile to that player. If you do so, you can acquire all other cards discarded in this player's discard phase from the discard pile. "Blunt advice" refers to Zhang Zhao’s various advices to Sun Quan. As an official of Wu Kingdom, Zhang Zhao aided the young Sun Quan to administrate internal affairs while Zhou Yu managed external affairs. Wise but stubborn, Zhang Zhao criticized Sun Quan whenever he found the Sun Quan's decision incorrect. Although Zhang Zhao was often correct, his blunt attitude angered Sun Quan to the extent that Sun Quan once thought of killing him. Thankfully Sun Quan was able to cool down and took his advice, which always benefited the Wu Kingdom. The ability mechanics seem to be play on the words "Blunt", and can be interpreted as being "in your face". That's how the ability works, by forcefully shoving weapons/armour/horses unto allies (or enemies when it is helpful). Not so much related to the story itself. "Stabilization" refers to Zhang Hong’s contribution to Wu Kingdom. Firstly, Zhang Hong made a plan for Sun Ce, advising him to defeat the warlords Yuan Shu 袁术 and Liu Biao 刘表 to obtain land for Wu Kingdom's survival. Secondly, after the death of Sun Ce, Cao Cao 曹操 intended to eliminate the Wu kingdom. It was Zhang Hong who utilized his diplomatic skills to stop Cao Cao, buying time for Sun Quan to cope with the internal issues of the state. Thirdly, Zhang Hong aided Sun Quan to consolidate his control in politics and in the military, even personally stopping Sun Quan’s reckless actions on the battlefield. Fourthly, he advised Sun Quan to set the capital of Wu Kingdom at Mo Ling 秣陵 (present day Nan Jing 南京), a strategic location which is most suitable to be held tightly. How does all this relate to picking up discarded cards and benefiting from it? I have no idea. Perhaps they simply needed any random name to affix unto this very cool ability?